What are the real costs and real benefits of building green?As any builder knows, cost estimation and reality are often two very different things. 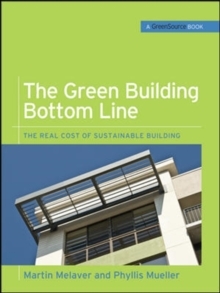 The Green Building Bottom Line makes the case for green building by providing the insights and data that demonstrate the true costs and benefits of building green. It's a "why to" and a "how to" that explores everything from the ground up. The Green Building Bottom Line puts an entire development team at the table to better understand both the issues encountered and what's behind the perceived price premium for building green. This candid and transparent account explores every aspect of green development on groundbreaking projects, from the nation's first all-retail LEED core and shell project to an innovative multitenanted LEED-Existing Buildings office project, to a mixed-use hotel-retail-condo project in a transitional urban market. The authors focus on such issues as values, culture, life-cycle costs, insurance, financing, coordinating a team, marketing, and negotiating leases.